I think you’ll love these Reuben Potstickers, and they make quite a few. The potstickers, themselves, have a rather light and airy quality, but the cheesy dipping sauce makes them incredibly rich and filling – allow five or six a person and think about skipping dinner. If you have extra, freeze the rest on a parchment or plastic lined tray, then put into a Ziploc bag. You’ll have potstickers whenever you want. They cook just fine from a frozen state. Just a couple notes on the pleating & crimping of potstickers. First of all, if you’ve never made potstickers, don’t be intimidated and don’t worry about perfection. I’ve probably made thousands and I’m still learning! Be patient. When I started, it took me a couple of batches to get it down; it took my son’s g/f three potstickers! How easy it is depends on how nimble your fingers are. The first few will be a bit slow but then you’ll pick up speed and in no time you’ll be crimping like a pro. Crimping from one side to another takes a little longer to master but is much quicker than going from the center out to each side. Make it fun! Put everything on a big cookie sheet & carry it in to the living room and watch a show; make them with friends or family. Use a little teaspoon scoop if you have one – it makes it so much easier to fill than a spoon does. 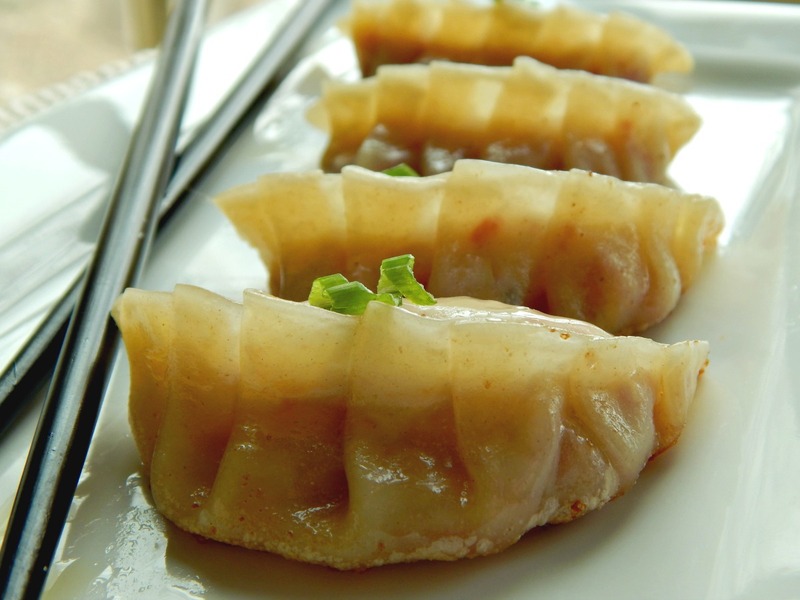 If you don’t feel like crimping a fancy potsticker, though, fold them in half and seal. They’ll still taste delicious! I think I will go ahead and bring this over to Angie at the Novice Gardener for this week’s Fiesta Friday, co-hosted by, Tracy @Scratch It Cook and Nancy @Feasting With Friends . Thanks, Guys, for co-hosting! I hope you enjoy these! I made these potstickers from my leftover Corned Beef Dinner, so they were very inexpensive to make. Maybe I should be a bit more precise – I made these from ingredients left over from my Reuben Sandwiches that were made from my leftover Corned Beef Dinner! Even my leftovers have leftovers! And why waste any extra sauerkraut? This year I also made one of the best-tasting soups I’ve ever made with the rest of the Corned Beef Dinner, Connemara Soup from the Simon Pearce Restaurant. 6 ounces of corned beef, chopped finely if this won’t be made in a food processor. Additional cornstarch for sprinkling on a plate or tray. Mix corned beef, cheese, sauerkraut, relish and green onion. This may be pulsed in a food processor, before adding green onion. Moisten with several tablespoons of corned beef broth (another broth may be substituted if you’ve bought precooked corned beef.) Use your judgment, the mixture should be moist but not wet. Mix in about 1/2 teaspoon of cornstarch. Ready your filling, a small cup or bowl of water, a couple of clean kitchen towels, one slightly dampened, and the wrappers. Sprinkle a plate or a tray with a little cornstarch. This is easily done by adding a teaspoon or so of cornstarch to a sieve and sprinkling over the surface. Work with six wrappers at a time, covering the remainder of them with a damp towel. Pick up a wrapper, use your finger dipped in the water to run a bead of moisture around the outside of edge of the wrapper. If the wrapper seems dry, add a little water on the edge you’ll be crimping, the front bottom edge when it’s in your palm. Add a scant teaspoon of filling, then fold in half, making certain it meets in the middle, but don’t press down, yet. Place filled and folded wrapper in your left hand, across your fingertips. You’ll use your left thumb and right thumb and index fingers to pleat and seal. Make the first pleat on the left side of the wrapper. Continue to shift and pleat, pressing each pleat to the back side of the dumpling wrapper as you go. Make sure no little pieces of filling are sticking up where the seal is going to be. Often when I get to the right hand side, I have to shift a bit and tap the filling down – this is a rather loose, fluffy filling since it contains cooked ingredients. Eight pleats is said to be an auspicious number, but I am more comfortable making seven. As each is done, place on tray by rows. As you place the dumplings, feel free to very lightly press so the bottom is flat and gently press the top into a curved shape, making sure the seals are tight. When your six are done, cover with the second towel and move on to the next six. Heat a large nonstick pan with 1 tablespoon of cooking oil over medium heat. When the oil warm, add the dumplings, flat side down, to the pan. If working with a large batch, starting at the center, place in concentric circles, as quickly as possible. If they’ve been sitting on cornstarch, brush any excess off before starting to fry. That little bit of cornstarch has a purpose; it helps the bottom fry up beautifully. Let fry for 1 minute until the bottoms are light golden brown. You may need to shift the pan slightly from side to side on the burner to make certain all the dumplings brown at the same time. Pour 1/3 cup of water (or broth) into the pan and immediately cover with a tight fitting lid. Turn heat to medium and let the dumplings steam for 3 minutes. Open lid and let the remaining liquid cook off about 1 minute. Check to see if the bottoms are crispy and golden brown. Place a large plate over the pan, and carefully flip the whole works. Hopefully, all the potstickers should come out, if not remove any others. To cook more, quickly wipe pan clean and repeat. a little sweet pickle juice and the brine from the sauerkraut to thin, start with a tablespoon each and add more after it’s melted. This can be made in a small pan, but is much easier in the microwave. Soften cream cheese, add the rest of ingredients and stir. Microwave until cheese is melted. Stir together. Add more of the pickle juice and/or sauerkraut brine until the sauce is desired consistency, keeping in mind it will thicken a bit as it cools to room temperature. Add Sriracha, I use two or three shakes, but add to taste. Feel free to taste and adjust to your liking; consider this to be a guideline. This recipe was featured on Fiesta Friday! Thank you guys, I’m honored! This entry was posted in Click here for Fabulous Food Posts and tagged Asian, Cheese, Corned Beef, Frugal Hausfrau, Irish, leftover corned beef, Leftovers, Sauerkraut. Bookmark the permalink. Hi. Sounds so good. I’m gluten intolerant. What can I do for the wrapper? Another option might be to make small crepes, gluten free, of course. You’d have to probably just fold the filling inside and panfry them. It wouldnt be quite the same, but I think it would still be delicious! You make making potstickers so easy! Thanks! While there’s no doubt they’re a bit piddly, they’re really pretty doable, and while the first ones may be a bit hard, it does get easier after a few! Hi, and thanks! 🙂 It’s a fun recipe! Definitely making these!! I already know I’m going to love them! Such an excellent recipe! Thanks, Angie! I hope ya love ’em! Thanks, Juju! I get excited every year for corned beef! And use every scrap of it. My husband is Japanese and we just love gyoza! Your recipe is fabulous! Hi Francesca! 🙂 I was introduced late in life to Gyoza and I’m wild about them! I can never decide if I like the crispy bottom, the tender top or the filling more! By the way, my son’s g/f & I stopped by a second hand shop on Tuesday and someone just my size with very good taste must have cleaned out their closet for spring. It was like I had walked into a fantastic boutique. Score! I know, right!? And now that you mention it, they were like pierogis with just a crispier bottom. Some day I’ll make pierogis! 🙂 Probably not corned beef – I’m a little corned beefed out this week!! Genius idea to use up the leftovers from your leftovers. 😉 I’m really kicking myself over the fact that ALL of my corned beef is currently gone. These potstickers certainly seem worthy of cooking up another brisket though! LOVE the delicious reuben flavors…and that dipping sauce? It sounds Mmm, mmm good. Thanks for sharing your creative recipe at Fiesta Friday! Thanks, Nancy. It seems like this year’s corned beef was like the little corned beef that could…especially since i made a a couple of Reubens, a big pot of soup and these. And I still have these leftover! Hah! Mine was gone after making corned beef hash, but I’m really thinking of getting another brisket so I can make these! If you do, let me know what you think! I imagine some groceries have slashed prices if they have any left! LOL! And thanks, Jhuls! 🙂 You should see my son with the hot sauces…yikes! I swear he could drink the stuff! You are funny 😉 and endlessly creative in your kitchen!! Thanks and Thanks, Elaine! lol! I like to play with my food – endless possibilities! 🙂 Oh, I forgot to say I checked my Mom’s dishes. They are Lenox fine china from the 50’s, so I guess it’s a timeless pattern! I have never seen anything like them before though, most China here has flowers. Your kitchen must be in perpetual motion! I have been posting too much, I think, but I’ve had some time on my hands! Seems like a good use of time to me?! Great Idea and they look yummy. I love coming up with twists on everyday foods. Wow, imagine making those, how tasty these look! Loved the video. These look fun and tasty! If hubby hadn’t asked me to create a Reuben Lasagna out of the leftovers, I’d try these! Will keep them in mind for next year tho. Thats such a cool idea, I love Reuben sandwiches never ever would have thought to make into Gyoza. You are really good at pleating, They look wonderful. Thanks, Suzanne! I felt a little twisted when I made them…lol! My son stopped by on his way to work and he was like, “These are insane!” so I felt pretty good about them.